The Dr. Carl Von Reynolds House, situated near the foot of Sunset Mountain in North Asheville, was built by Reynolds for his family in 1909. The imposing, porticoed residence was one of the first built in Proximity Park and is one of the best examples of the Neoclassical Revival period in the city. Dr. Reynolds served as the city health officer and later as a state health officer. He was a native of Asheville, descended on both lines from pioneer Buncombe County families. He was instrumental in the founding of the School of Public Health at the University of North Carolina in Chapel Hill. Reynolds and his wife, Edith, lived in the house until 1920 when they sold it to the Grove Park School, a private institution founded in 1900 as the Asheville School for Girls. During the 1920s, a classroom building was constructed adjacent to the house. In 1929, Drs. Laura and Lillian Plonk moved their Summer Workshop to Grove Park School. The Workshop stressed "speech, drama and living" and was affiliated with the Curry School of Expression in Boston. The Workshop had been located in several high schools in Asheville, but with its move to the Grove Park School, the name was changed to the Plonk School of Creative Arts. In 1941, the Plonk School moved and the house became the Albemarle Inn. The Inn attracted many celebrated guests including Hungarian composer Bela Bartok. 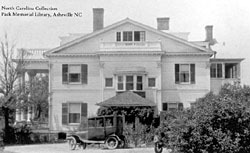 Bartok completed his Third Concerto for Piano, also known as the Asheville Concerto, while residing at the Albemarle Inn. Today, the rehabilitated building continues to operate as a traditional inn, relying on its history in Asheville and its turn-of-the-century architecture to attract guests. 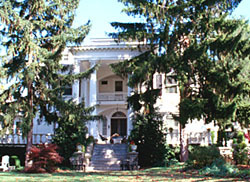 The Carl V. Reynolds House, now the Albemarle Inn, is located at 86 Edgemont Rd. off Charlotte St. It is open to the public; for further information contact the Inn at 1-800-621-7435 or visit their website.